Aara Macauley’s passion for the written arts led her to pursue a B.A.H in Classical Studies and an M.A. in Latin Literature from Queen’s University. Aara ran her own local retail business, Get Funky Boutique for four years and has been involved in the fundraising, event planning, and promotion committees for various local cabaret, film, and arts festivals. She recently completed a 6-year term on the Reelout Arts Project Board, including 4 years as Chair. She performs in the occasional cabaret fundraiser, and with local musicians the Huaraches. Aara is also a self-confessed foodie; a cookbook, hot sauce, and spice collector, and passionate home cook – though she is still striving towards the perfect sourdough. 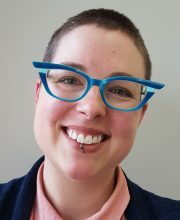 An accomplished juggler, Aara has volunteered and worked in various roles with the festival since 2014, moving from archivist to administrative assistant and box office services manager, then adding the role of writers services manager in 2015. She transitioned to the role of administrative coordinator in 2017. Aara is a discerning and eclectic reader, and sits on the Kingston WritersFest program advisory.